Peptide CQKEAKRSSADKGVALSLDD, corresponding to amino acid residues 469-488 of rat ASIC1 (Accession P55926). Intracellular, C-terminus. Homology Human - identical; mouse - 19/20 amino acid residues identical. Specificity This antibody will recognize all known ASIC1 isoforms. 1,2. Guinea pig Anti-ASIC1 Antibody (#AGP-053), (1:600). 3,4. Guinea pig Anti-ASIC1 Antibody, preincubated with the control peptide antigen. 1. Guinea pig Anti-ASIC1 Antibody (#AGP-053), (1:600). 2. Guinea pig Anti-ASIC1 Antibody, preincubated with the control peptide antigen. Immunocytochemical staining of fixed and permeabilized C6 glioma cells. A. 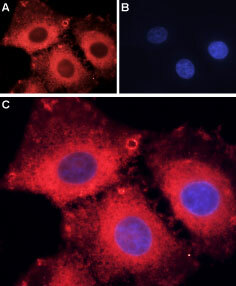 Cells were stained using Guinea pig Anti-ASIC1 Antibody (#AGP-053), (1:200) followed by anti-guinea pig-AlexaFluor-594 secondary antibody (red). B. Cell nuclei were visualized using Hoechst 33342 (blue). C. Merge of the two images. Wemmie, J.A. et al. (2002) Neuron 34, 463. Wemmie, J.A. et al. (2003) J. Neurosci. 23, 5496. ASIC1 is a member of a family of Na+ channels that are activated by external protons. The family includes four additional members: ASIC2, ASIC3, ASIC4 and ASIC5. The ASICs are in fact part of a larger superfamily named degenerin/epithelial Na+ channels (DEG/ENaC) and share with it the same basic characteristics: two transmembrane spanning domains, a large extracellular domain and short intracellular N- and C-termini. ASIC1 responds to a decrease in extracellular pH with an inward cation current that is quickly inactivated despite the continuous presence of protons in the medium. Recently, ASIC1 has been implicated in cognitive processes such as learning and memory. Immuno-colocalization of ASIC1 and ASIC3 in rat DRGImmunohistochemical staining of perfusion-fixed frozen rat dorsal root ganglia (DRG) sections using Guinea pig Anti-ASIC1 Antibody (#AGP-053), (1:400) and rabbit Anti-ASIC3 Antibody (#ASC-018), (1:400). A. ASIC3 staining. 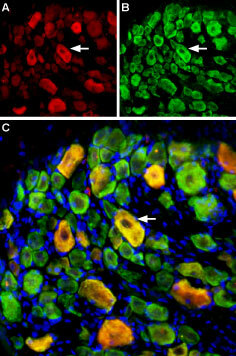 B. ASIC1 staining in same section (green). 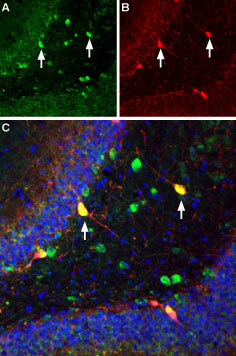 C. Merge of the two images shows some co-localization (arrow). Cell nuclei were stained with DAPI (blue). Alomone Labs is pleased to offer a highly specific antibody directed against an epitope of rat ASIC1. Guinea pig Anti-ASIC1 Antibody (#AGP-053) raised in guinea pig can be used in western blot, immunohistochemistry, and immunocytochemistry applications. It has been designed to recognize ASIC1 from mouse, rat, and human samples. The antigen used to immunize guinea pigs is the same as Anti-ASIC1 Antibody (#ASC-014) raised in rabbit. Our line of guinea pig antibodies enables more flexibility with our products such as immuno-colocalization studies, immunoprecipitation, etc. Reed-Geaghan, E.G. et al. (2016) J. Neurosci. 36, 4362.